Dan Gilroy, brother of Tony, took over some of the writing duties on the Bourne franchise from his older sibling, who also directed the Jeremy Renner outing. Gilroy also penned Real Steel and Tarsem's The Fall. 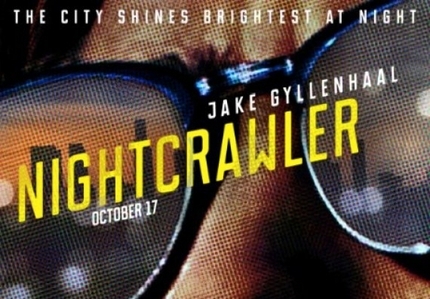 Here he makes his directorial debut with Nightcrawler, a film that foolishly escaped my gaze in yesterdays big TIFF announcement. As of this moment, the trailer certainly has my attention. Jake Gyllenhaal, on fire after his one-two punch with Denis Villeneuve last year (Enemy, Prisoners) plays Lou Bloom, an ambitious, morally dubious crime reporter in Los Angeles who, judging from the images on display, will do anything to climb the ladder at the TV newsroom. In a brilliant pitch, the trailer is narrated as a perky job interview (to a fetching, as always, Rene Russo) while the visuals ooze pure sleaze, opportunism and larceny. Bill Paxton (also on fire lately as a ringer support-man) also shows up for a few seconds. Between this and P.T. Anderson's Inherent Vice, it looks like the L.A. crime thriller is back in a big way this fall. This pleases me greatly.